By Ashutosh KS in Mobile. Updated on November 13, 2018 . Android, with all its design charm and ease of use, is one of the most powerful platforms for mobile devices. However, in order to use your Android device to its full potential, you need the right kind of apps. There are certain apps that help your Android device gain more power and speed, enable new features, and give it a customized look and feel the way you want. Alright, let’s check out the list of some awesome, neat, featureful apps designed specifically for the power user in you and help you to do more. 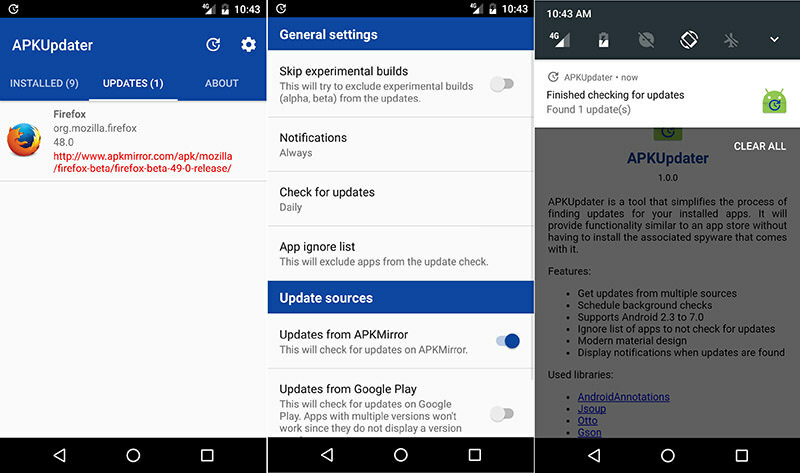 APKUpdater is a handsome tool to update your apps even if your device doesn’t support Play Store or if you’ve sideloaded the apps using their APKs. This app checks for updates for all installed apps from time to time by searching multiple app stores. And thus simplifies the overall task of updating installed apps for the power users. MacroDroid is an automation tool that helps run macros in your device. These macros work by themselves given the situations and you get your things done magically. For example, your phone can speak out incoming notifications to you if the headphone is plugged in. The app offers various built-in and user-created templates to quickly get your work done, and you can even edit these templates to suit your needs. Resilio Sync is an awesome app for syncing data between your devices without any Internet connection. It works similar to SHAREit but adds auto-sync feature on top. The app supports syncing files between your Android and your PC, Mac, NAS and even some server, and encrypts all transfers for best protection. 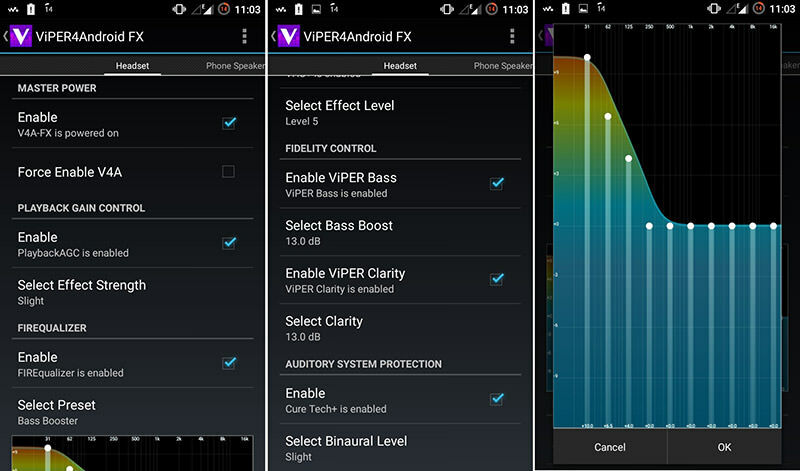 Equipped with highly advanced bass, clarity and gain boost controls; Viper4Android FX enhances your audio experience like never before. Its pre-installed 10-band fire equalizer provides a firm grasp on adjusting the output sound for different devices. Also, its “Auditory System Protection” feature protects you from ill effects of heavy bass and high volume. 3C Toolbox is a "swiss army knife" of tools and utilities, combining numerous features into a modern yet easy-to-learn interface. Besides offering tools like task manager, file explorer system and battery manager, it monitors the Android system including processes, battery, etc. Moreover, it helps you to run custom scripts and switch system components easily. Servicely is a service terminator, which you can use to select and kill unnecessary tasks and services running in the background. It’s as simple as to select the apps and press a button to terminate the tasks automatically. The app helps you to free up resources, thus improving the performance, saving the battery juice and boosting your Android experience. Unclouded helps you explore, analyze, manage and clean device as well as cloud storages. You can check the changes done to the files along with storage statistics showing the files and folders utilizing heavy space on your device. That’s not all, this app supports various cloud services like Dropbox, Google Drive, OneDrive, Box and MEGA. 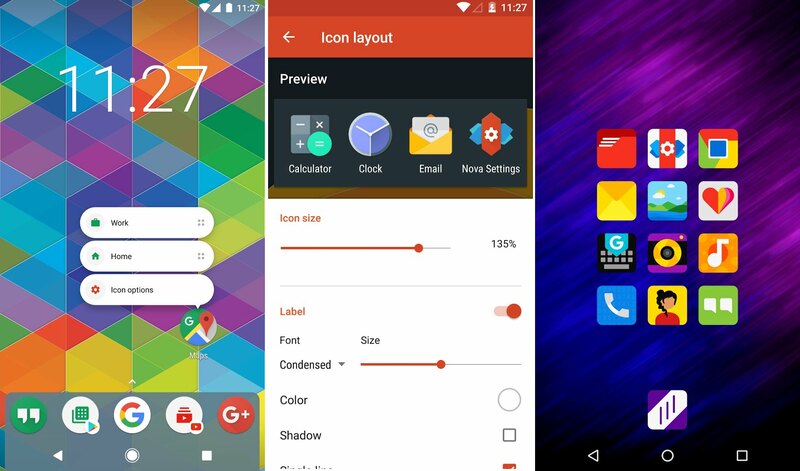 As the name suggests, it’s basically a launcher which helps to customize the homescreen, app icons, layouts, animations and more. You can control colors for labels, folders, tabs and backgrounds and much more to make it your own. The app performs faster than some others and offers numerous presets, icon themes and widgets. 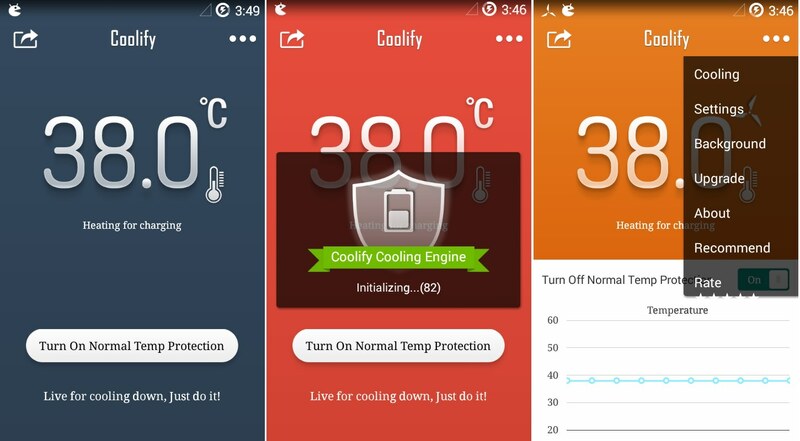 As the name suggests, Coolify helps cool your device, which is really helpful after playing hi-fi, rich graphics games. It optimizes the apps using its built-in tweaks and scripts and enables better performance of device’s hardware. Moreover, the app also controls the running applications and thus tries to keep the device at normal temperatures. 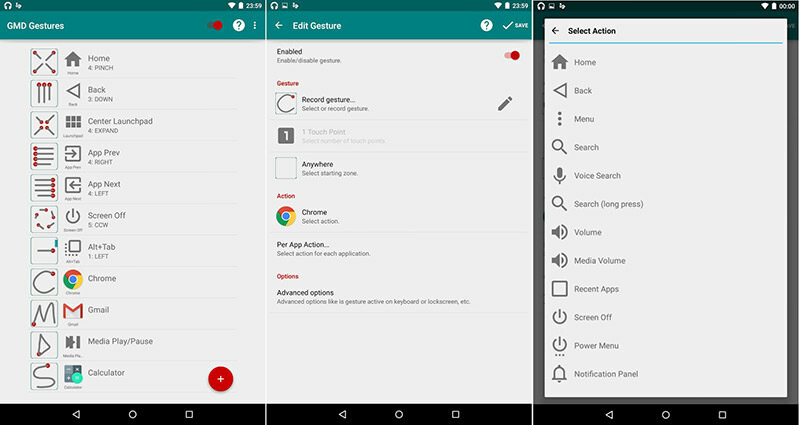 Automate is an automation app and scripter, which lets you automate almost all the tasks on your Android like configuring settings, toggling hardware, etc. You can even send texts and emails per your preferences of time and location, all using this easy-to-use application. The automation works by creating visual flowcharts as shown below. SD Maid includes various app and file management tools, which help to tidy your Android device, making it clean and fast. The app auto-initiates a system scan and deletes logs, crash reports and other useless files that consume avoidable space. Apart from that, it features database optimizer, disk space analyzer, duplicator finder, etc. in a nice, clean interface. AFWall+ is a simple, useful tool to manage network access. That means, you can allow and restrict applications from accessing the device’s 4G/3G/2G/Wi-Fi networks. The app can also manage the network traffic of any VPN or LAN along with default networks. You can create profiles, set custom preferences, lock the app and do lot more. 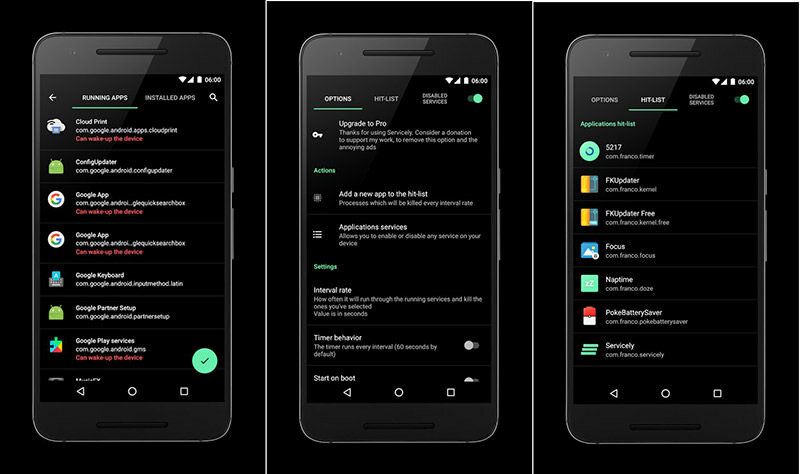 Flynx is a productivity app that helps to open multiple articles or links in the background from all popular apps on your Android device. It automatically loads them in the background and shows floating icons for them like Messenger’s Chat Heads. The app keeps you from waiting for links to load, and also lets you get back to them anytime. Pushbullet has an integrated interface from where you can send and receive messages from popular apps like WhatsApp, Kik and Facebook Messenger. 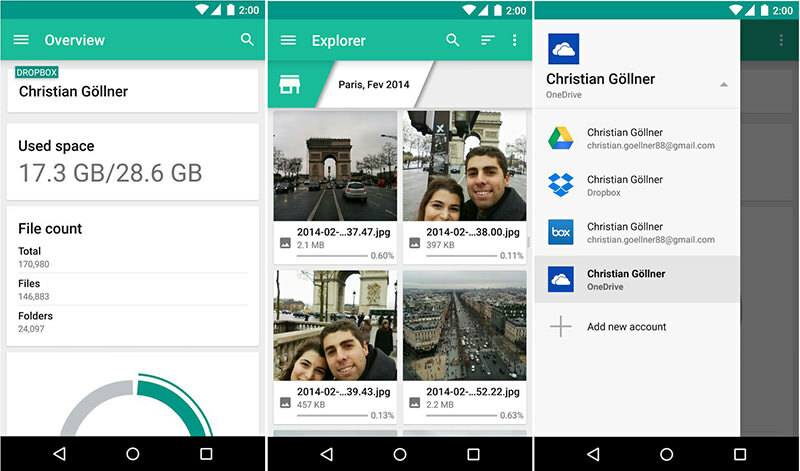 You can even share important links and files among your friends or other devices. Additionally, it allows sending and receiving text messages (SMS) directly through your computer. Dumpster is an advanced "recycle bin" that allows users to restore or undelete their accidentally deleted files. Besides the effortless restoration feature, it’s equipped with an "Auto Clean" option and a premium cloud storage facility. Also, it offers a "Lock Screen" option to enable secure access to all your personal and important files. ES File Explorer is an effective and fully featured file manager that helps you analyze and access the filesystem. It supports almost all file management actions and various storages including cloud storages, FTP, etc. 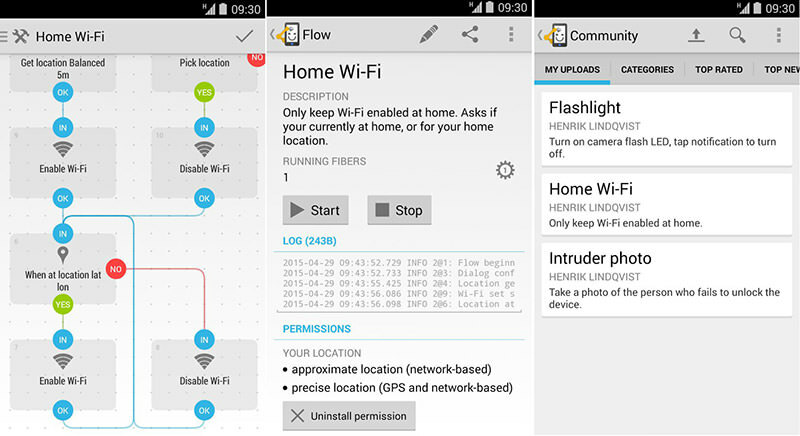 Moreover, it offers a "Wi-Fi File Transfer" feature to share files between wirelessly connected devices for free, and its "Remote File Manager" feature helps you manage phone’s files from a computer. 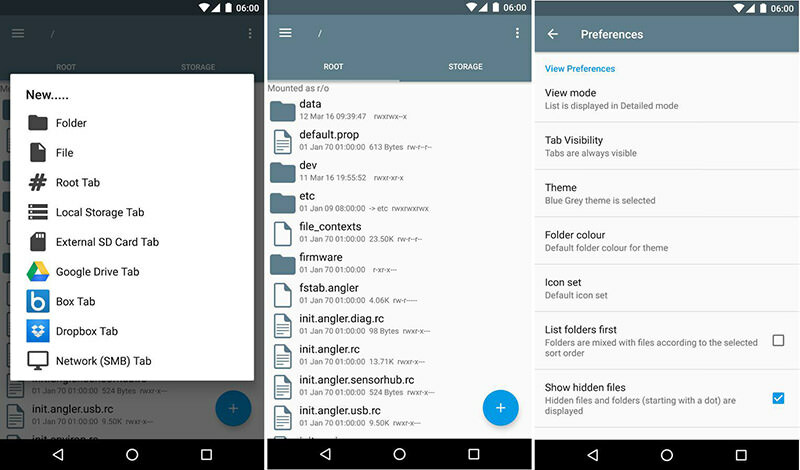 Root Explorer is a superb file manager for power users, giving them the power to access and control the filesystem. It’s equipped with useful features like support for Google Drive, Box and other clouds, SQLite DB viewer, and an archive manager. That’s not all, it has much more to offer including an option to share files via email, Bluetooth, etc. Smart Booster works gradually to boost up the RAM on your Android device. 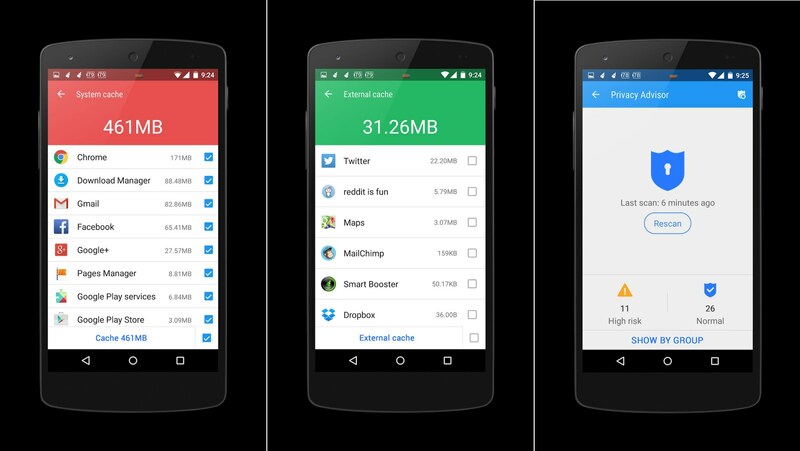 Just a single click can clean all the cached data from your phone’s memory, making it free for other apps. Additionally, it is a great application manager that not only optimizes your device but can also scan and clean all the junk created by the installed apps. 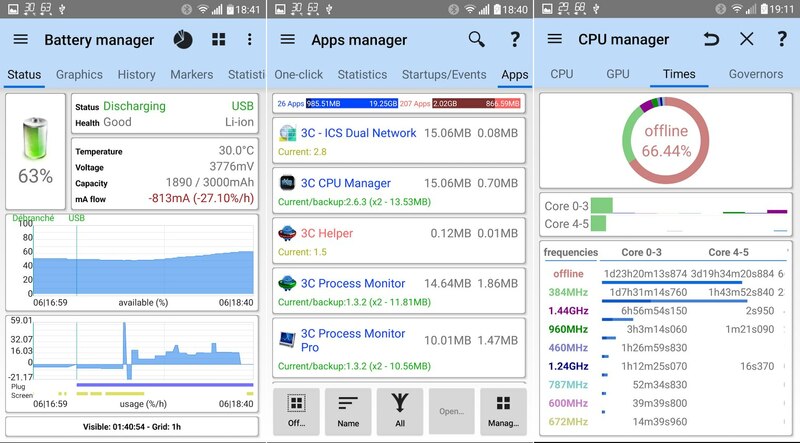 System Monitor is an intelligent app that provides real-time statistics about your Android and its internals using beautiful animations and graphs. 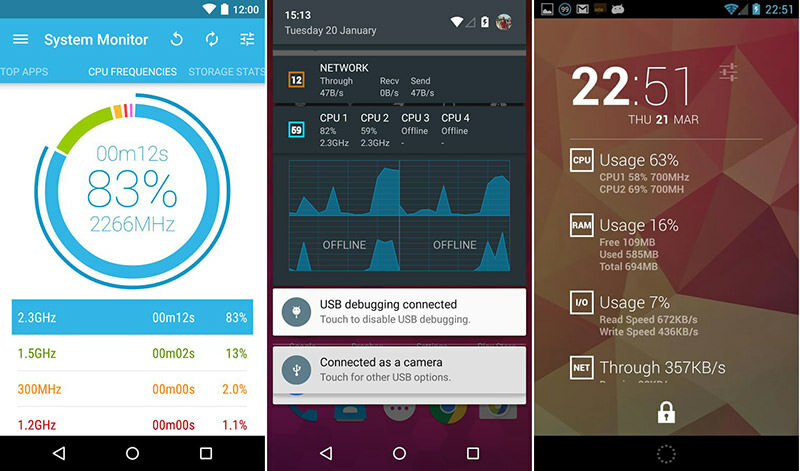 You can monitor your device’s CPU, input/output, RAM, networks, apps and the battery life. These load statistics prove helpful to understand the installed apps and optimize performance. 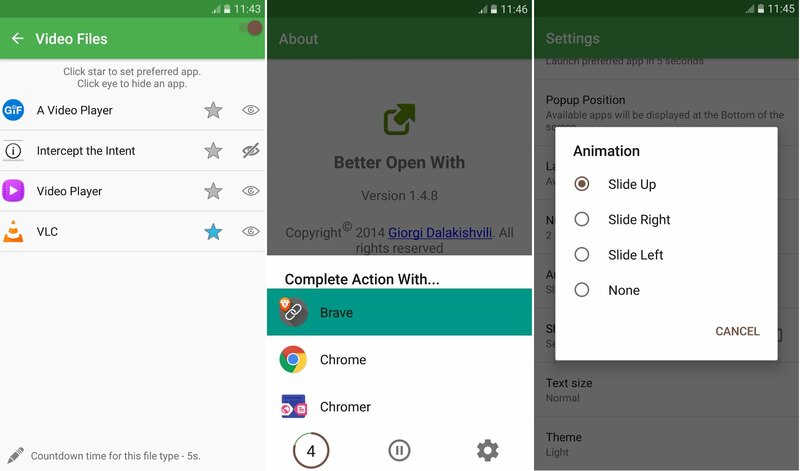 Better Open With provides the facility of choosing additional app handlers than the default ones to open or run a particular file or link on your device. 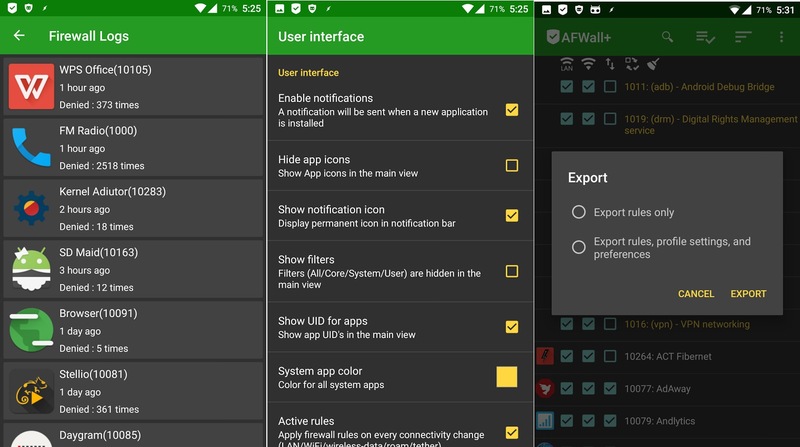 It was initially created to mimic the Android’s "Complete action using" dialog with its own customized screen that pops up with all the available and configured app handlers in the device. DiskDigger is a backup tool that can undelete or restore accidentally deleted photos and images. 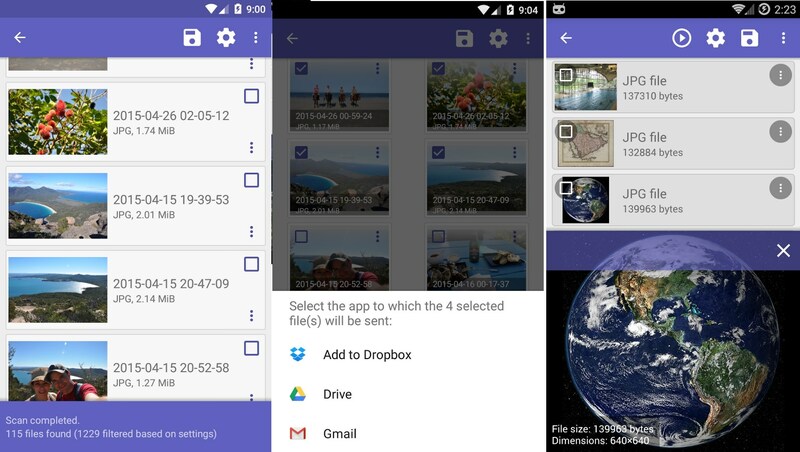 Using this app, you can also directly upload the recovered files to your Google Drive or Dropbox and can even mail them within seconds. It works on non-rooted devices but in a limited mode for photos only, but with root access, it searches for videos too. 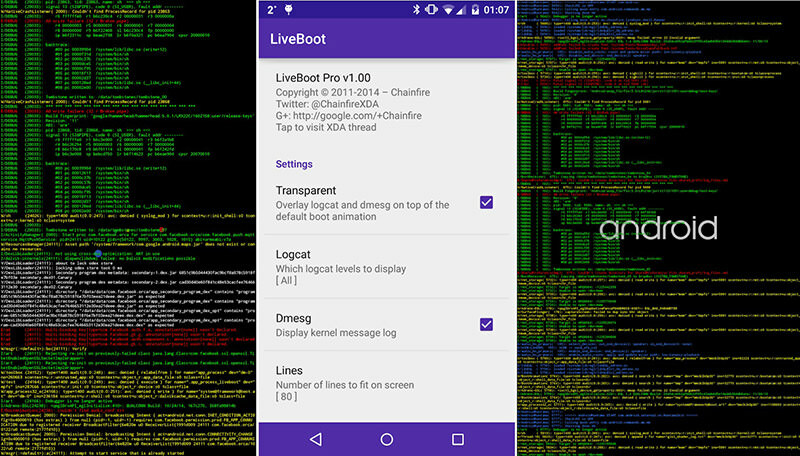 LiveBoot is a boot animation app that displays the ongoing system output on your device’s screen when your phone is booting up. Normally, your manufacturer’s logo is shown at the time of boot but this app changes that. You can configure the background, wrap lines or color format the output, and moreover, you can also test the app without rebooting. Rec. 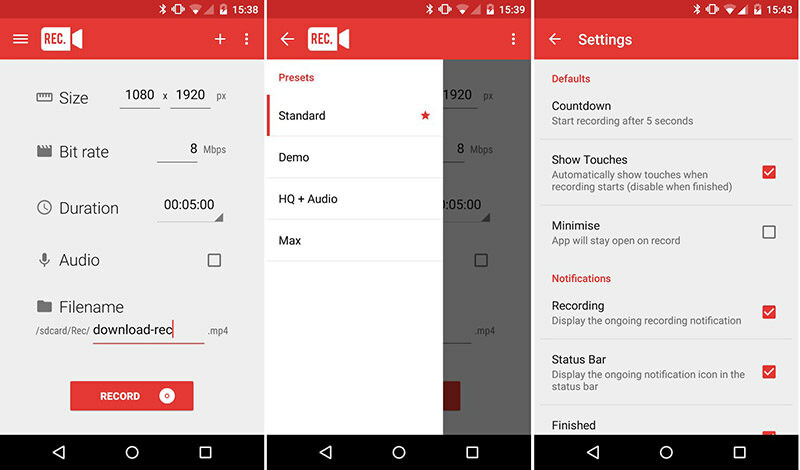 is an amazing screen recording tool inculcated with flexible and configurable screen recording capabilities for Android. Its pro version boasts of an efficiency of recording the screen up to 1 hour along with audio (via mic). It can also record the screen touches and stops simply on shaking the device or switching the screen off. 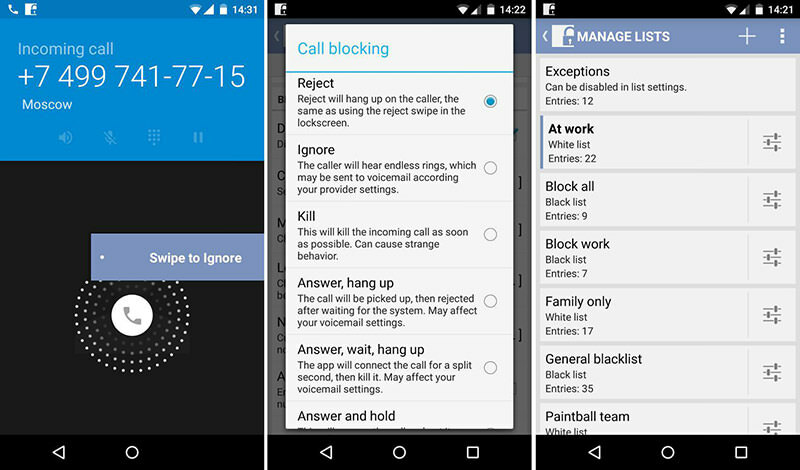 This app is a very powerful call, SMS and MMS blocker specifically designed for the root users. It simply blocks messages even if it’s not the default messaging app, unlike other solutions out there. For calls, it prevents the phone from ringing and supports rejecting, ignoring and hanging up the incoming calls based on your preferences. 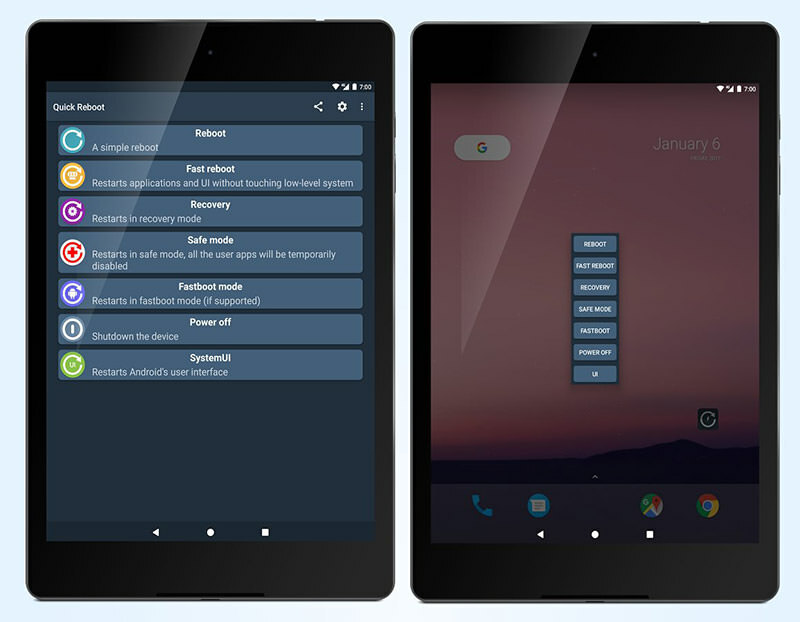 GMD GestureControl app lets you control your Android device with multi-touch and multitasking gestures like that on the iPad. You can also customize the gestures and use them for custom actions per your requirements. Moreover, you can hide your system bar to enjoy a full-screen mode for games, movies or any other app using this application. 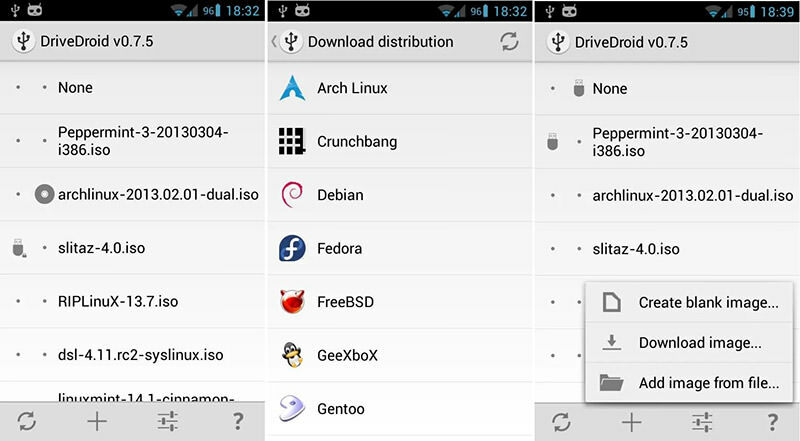 DriveDroid lets you run various Linux distros through your Android device. The app allows you to boot your PC from ISO/IMG files stored on your rooted device. It also includes a download menu to download the USB images of distros such as openSUSE, Arch Linux, Ubuntu, Mint, and Fedora. And you can even create blank images if required. 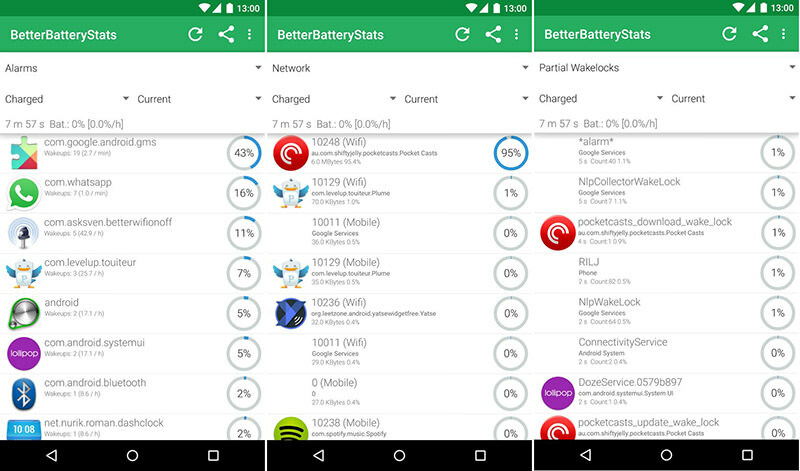 Using BetterBatteryStats, you can easily analyze the apps that drain your phone’s battery. It suggests corrective actions to disable or terminate such apps for improving and saving the battery life. Moreover, it also measures the impact of possible actions and helps you do the choose the best options to boost your device’s battery. 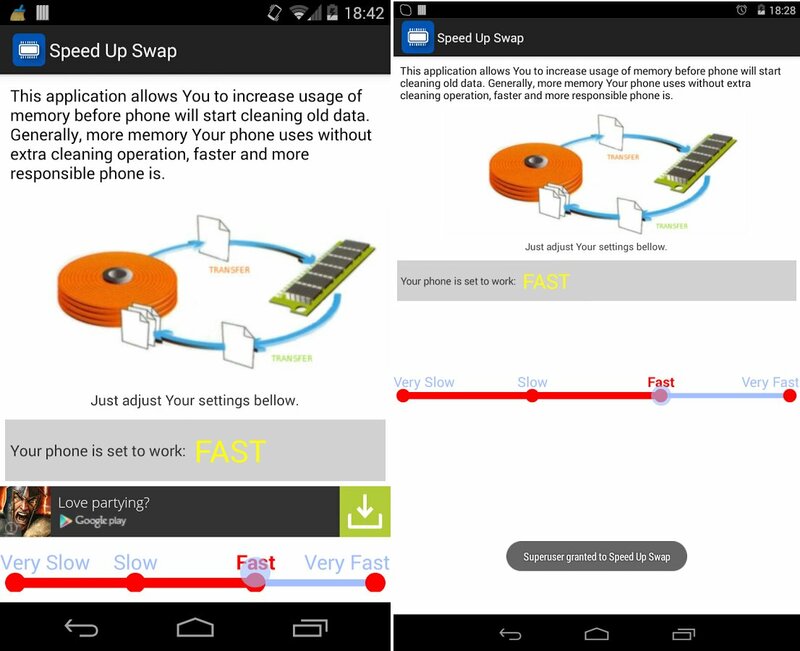 Speed Up Swap is a small, powerful app that lets your Android device use the memory more efficiently. That means, it will not just speed up your device but also improve its responsiveness without the need of upgrading your phone. Please remember, however, that messing up with this app can result into terrible results. 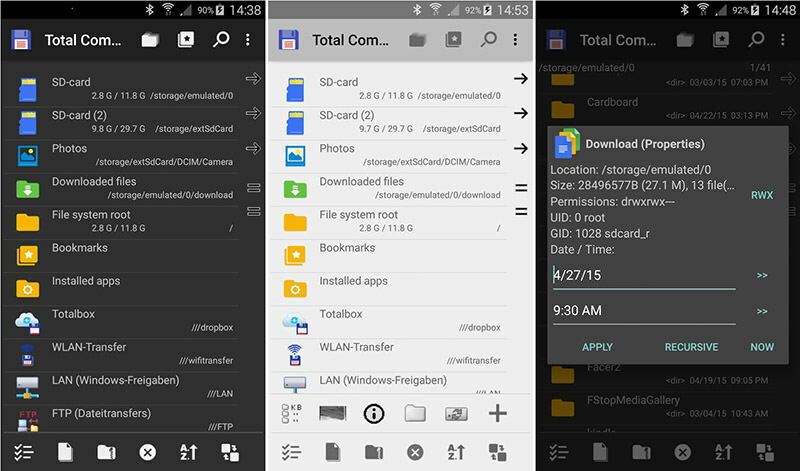 Total Commander is a handy file manager like ES File Explorer. Using this app, you can make directories, change permissions, drag and drop files, and search, delete and even share them via Bluetooth. It also offers simple utilities like text editor, file searcher, archive manager, FTP/SFTP client, cloud manager and many more in a single app. Build Prop Editor lets you edit your system’s properties files like "build.prop" with an intelligent code editor having syntax highlighter. It’s a plain simple app to make advanced changes in your system using the properties files, and to save you from hassles, it also creates an auto-backup before making changes to avoid probable issues. 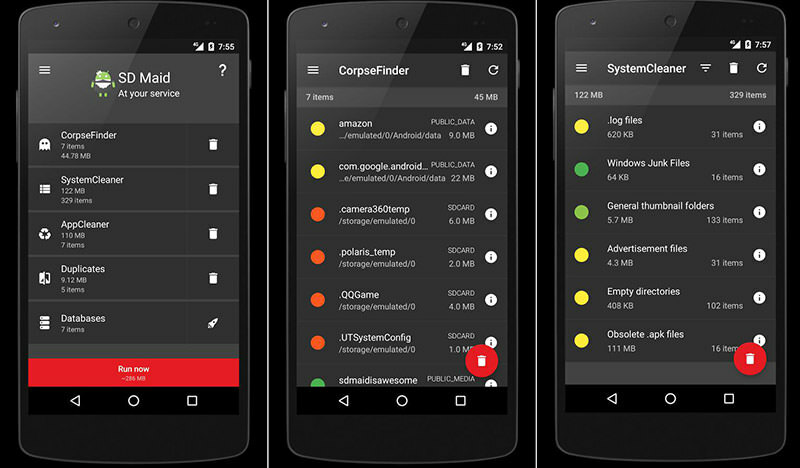 Wakelock Detector checks the wakelock usage, and thus determines the battery draining apps installed in your device. The app tells you which apps hold your device’s screen on and cause battery issues. You can easily disable those apps or remove them to save the battery life and boost the performance. DNS Changer is one of its kind utility for advanced users that allows changing DNS entries on your device. 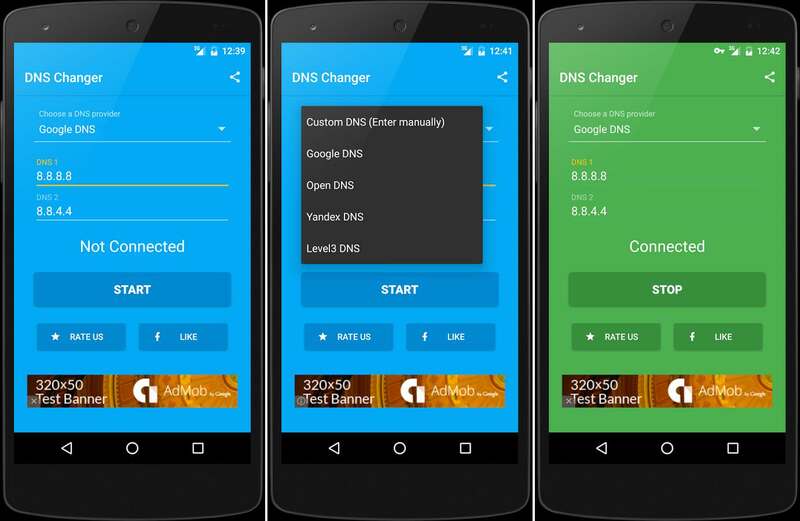 The app lets you change DNS for both mobile data and Wi-Fi networks, and even works for both rooted and unrooted Android devices. Also, this app packs in the features in a neat and modern interface. GLTools provides complete control over your phone’s resolution, shaders and textures. It means that you can decompress, recompress or can even resize textures anytime even if your phone doesn’t support that format. You can even enable an FPS counter on your screen and MSAA or CSAA in the apps to enhance graphics quality. If you are fed up of using ADB or terminal to reboot in various advanced modes, then Quick Reboot can help you. Equipped with a lot of advanced reboot options and features like safe mode, normal reboot, fast reboot (UI or apps), reboot to recovery or bootloader and restart SystemUI; this app makes your experience smoother than ever. Log Viewer is a simple and lightweight app for viewing text or log files. 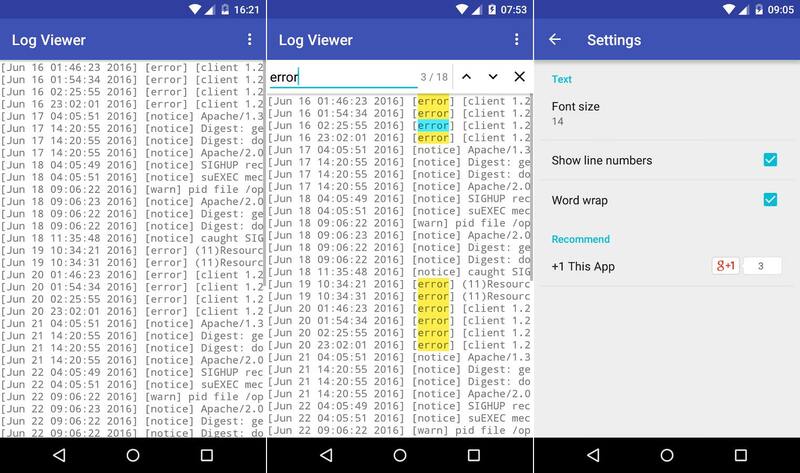 The app is very useful for budding developers who wish to see the logs of their own app directly on the Android device. 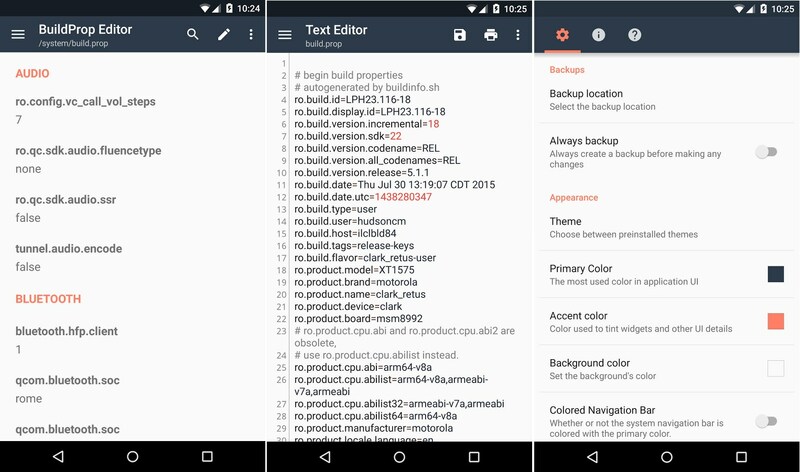 And it also helps non-devs to check out logs of any crashed app and report the issue, and it allows searching, setting font and more customization. 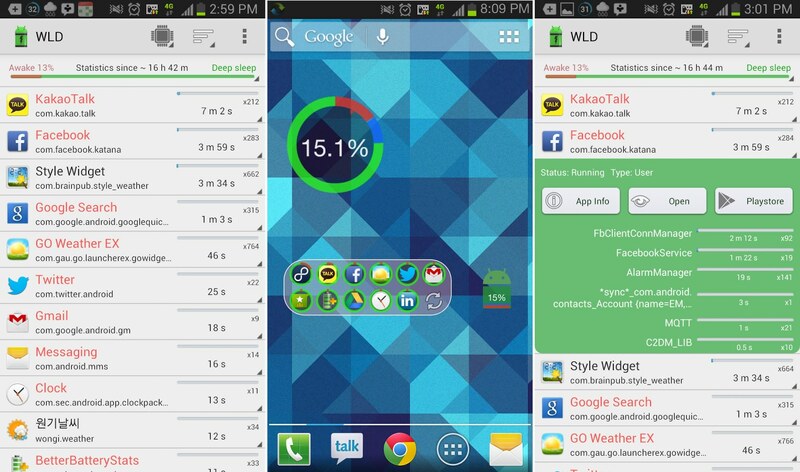 That’s all about the numerous useful Android apps for the "power user" in you. Please use these apps cautiously as many of these require a rooted phone and tampering with such applications may cause serious damage to your device, if not taken proper care. Which is your favorite app among these? Do you use any other app for utilizing the full potential of the Android platform? Please share with us using the comments.